The Comeback Kids have done it again. Trailing by 20 with less than 12 minutes remaining, no. 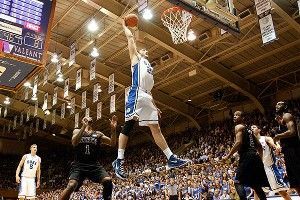 4 Duke rallied to beat NC State 78-73 at Cameron Indoor Stadium. Once again, it’s a tale of pluck and resilience befitting a school filled with so many rags-to-riches students — the downtrodden, lowborn souls yearning outside the gates of power — who never stopped believing in themselves and their ability to climb within the system. O, Duke, you beacon of the little man, you shining symbol of mobility! Lady Liberty is your virtuous maiden, Uncle Sam your protecting angel! Not to be outdone, no. 21 Florida State kept pace at the top of the ACC by coming back from an eight-point deficit with just 1:29 left and beating Virginia Tech 48-47 on Michael Snaer’s late 3. The struggling Hokies got more bad news after the game when they found out that their legal status as a basketball team had been revoked by President Obama to save money. Draymond Green scored 20 points and grabbed 10 boards as no. 8 Michigan State earned a share of the Big Ten lead with a 69-55 win over no. 17 Wisconsin. In an unprecedented move, the tournament committee gathered early and decided to pencil the Spartans in for a 15-point loss in the Final Four, effectively ending their season. In an appearance on the Michael Kay Show, Jeremy Lin said that he got his shot in the Knicks’ starting lineup because Carmelo Anthony vouched for him with coach Mike D’Antoni. According to sources, Anthony is already practicing how he’ll tell the story in bitter fashion when he’s sitting at a seedy bar in 15 years, penniless and alone. In other Lin news, the NBA added him to the roster for the Rising Stars Challenge, which features the best rookie and second-year players in the league. Shaq and Charles Barkley were in charge of drafting the teams, and Lin was picked third, behind Blake Griffin and Kyrie Irving. Or, as they’ll be known from now on, Hakeem Olajuwon and Sam Bowie. LeBron James said he would be open to returning to the Cleveland Cavaliers at some point in the future. “If I decide to come back, hopefully the fans will accept me,” he said. “No problem!” said cheerful Cavs fans, though they wouldn’t comment on why they all held glass bottles filled with gasoline and motor oil and white rags for caps. A hedge-fund manager named Christopher Hansen proposed a $450 to 500 million sports arena in Seattle that could eventually bring the NBA back to the city. The plan is being vigorously opposed by Mariners infielder Chone Figgins, who decided that if he’s going to be hated by the city anyway, what the hell, he should just go all out. OK. Here we are again, ready for the highly anticipated return of PARTICIPATION FRIDAY! You get the idea. I started wondering what my motto would be, and realized it would be far less grandiose. Probably embarrassing. This week, I want you to send me your personal motto. Making me laugh out loud is a sure way to make the cut. The 10 best will be made world famous next Monday in this very space. Send your entries to tobaccordblues@gmail.com, and have a great weekend.